Karen Hochman Brown makes mandala-like works that begin with photographs that she then spins and adorns into digital prints mounted on aluminum. Layer upon layer of detail come together to make one image. She meticulously alters light and shadow to create an illusion of depth. In many cases, dots are added for emphasis and direction. As a child in her mother’s garden, Hochman Brown recalls how flashes of color and light dance as she holds her first kaleidoscope up to one eye, closes the other, finds a source of light, and the rest of the world disappears while she endlessly turns. The artist uses light to transform broken bits of colored glass into symmetrical rays. In some works, identical triangles recede and create vibrant and sometimes momentary, fragile patterns. Precision is always required. Hochman Brown uses computer software and hardware to replace the simple handmade kaleidoscope of her youth. She turns, layers, and spins her photographic reflections, brightly illuminated by her computer monitor. No longer restricted to a three-way reflection or a flat mirror, her artwork plays in the realm of infinite images. Hochman Brown had found her passion for art in her early primary school years. 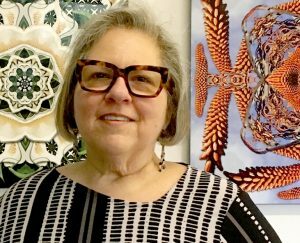 In high school she discovered geometry and did not hesitate to fuse mathematics with her artwork, exploring intersecting circles, and patterns. To the artist, there was a distinct and immediate marriage of mathematical precision and aesthetic beauty. After she received a B.A. in Art from Pitzer College in Claremont, she continued to study math and did post-graduate work at California College of Arts and Crafts, creating a course titled Construction Geometry Via Art. She taught this curriculum at the Arts Magnet High School in Oakland, CA and in Altadena at the Waldorf School. In 1984, after buying her first Macintosh computer, she further tightened the role and interconnection of art and math via the medium of technology. She went back to school again, taking classes at UCLA and Art Center College of Design, to study computer-based graphic design. Using her years of education and experience, the artist creates digital art that explores “hidden worlds” within manipulated reflections of flower imagery, using fractal geometry-based software. Karen Hochman Brown creates fantastical explorations on subjects from nature. Each artwork starts with a single photograph Hochman Brown manipulates on her computer, importing the image into a modular graphics-synthesizer program where she pulls out specific elements from the photographic imagery, altering layer after layer to create new compositions with kaleidoscopic reflections. By operating different functions and formulas—such as polar space, fractal space, assorted modulations, reflections, waves, distortions, symmetry—she identifies, saves, and collects a series of images or “foundlings.” With the foundlings, she masks out areas to reveal the most interesting parts and makes color adjustments. Next she stacks the foundlings into multiple layers. As the work develops, the artist returns to the modular graphic-synthesizer, creating additional foundlings as needed. As a finishing touch, she adjusts shadows and lighting on each layer to enhance the illusion of depth.